This sample is back in case you missed out before! 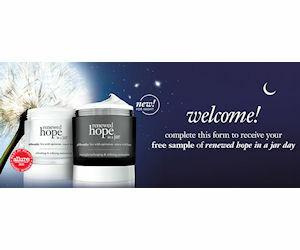 Grab a free sample of Philosophy Renewed Hope in a Jar! PLEASE NOTE: You MUST click the VERY small text directly on top of the 'hope never rests' image. Click the text says 'RECEIVE YOUR FREE SAMPLE OF RENEWED HOPE IN A JAR' to access the sample request form.